CHAMP MULTI- 400 and CHAMP MULTI- 600 are Multi process welding outfits with Inverter based welding power source. 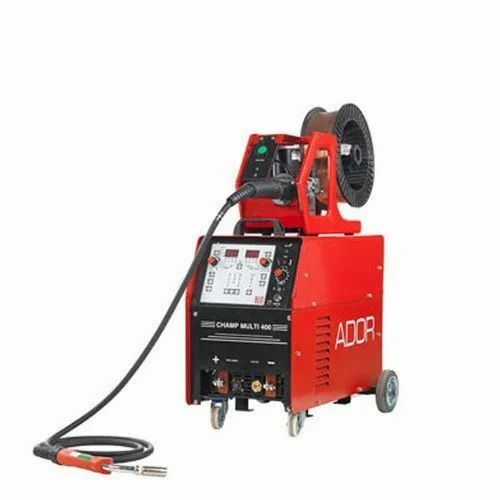 In order to furnish the variegated desires of our clients, we have brought forth an extensive consignment of Ador Champ Multi MIG Welding Machine. The IGBT power module, High frequency transformer and fast recovery diode are used as key device for power conversion and transmission to assure better Efficiency and performance. The welding power source has both constant current (CC) and constant voltage characteristics (CV), which are suitable for MMA and MIG/MAG and FCAW applications. Set output parameters are constant against input supply variations. Power source is protected against single phasing, under voltage, over voltage, short circuit and temperature rise. Water cooled version available for CHAMP MULTI 600 as option. MMA process with this outfit is most suitable for all kinds of electrodes including CELWEL for fabrication work, pipe welding, site construction etc. GMAW process is suitable for welding in semiautomatic/ automatic mechanism for welding MS, SS and Al materials with Solid and Flux core wires (FCAW Mode). Both the models can operate with single point Synergic control in MIG/MAG mode. The complete system consists of Power Source, wire feeder, torch and inter connecting cables and control cables between wire feeder and power source. Available with both Gas cooled and Water cooled MIG Torches for 600 Amp model. Single point Synergic control in GMAW. Auto “Weld Stop” when welding torch is taken away from work piece. 2T, 4T and SPOT and Multi Spot operating modes in MIG Mode as well as FCAW mode Dynamic Inductance adjustment in GMAW process and Arc force adjustment in MMA process for better arc control. Crater voltage and Crater current adjustment through digital panel. Unique feature of Pinch-off pulse to avoid globule formation. Established in the year 2005, "Raj Engineering" is a well-known Wholesaler and Trader of Welding Machines, Welding Wires, Welding Electrodes and much more.